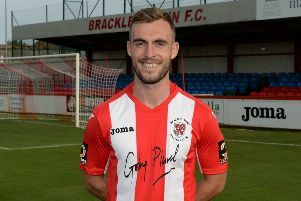 Brackley Town manager Jon Brady is confident his side can overturn a 2-1 deficit in their play-off semi-final second leg against Altrincham tomorrow. Saints produced a battling away performance in the first leg at Moss Lane on Tuesday and they were seconds away from earning a deserved draw before Jake Moult leathered in a superb 20-yard volley in stoppage time. Brady said: “You’ve got to take it on the chin, you can’t get your head down in a situation like this. “It’s 2-1 and it’s finely poised, they’ve got to come to our place and we can be amazing at our place and I look forward to us really taking the game to them. Jefferson Louis had given Brackley a 70th-minute lead with a fine headed finish on Tuesday evening but two Altrincham goals in the final 15 minutes turned the tie on its head. Brady added: “I thought we came out of the blocks really well, we penned them in the first 20 minutes and we didn’t give them a sniff. But we started to get a bit sloppy and gave away too many fouls in the first half. “We rode our luck a little bit with them hitting the bar three times, but we also hit the post with Izak [Reid], and Eddie Odhiambo also had a good chance. Brady is also keen to see a big crowd at St James’ Park tomorrow and is urging as much of Northamptonshire to get behind the team as possible.